Whether you've just bought the new 2018 iPad Pro with Face ID, the 2018 9.7-inch iPad with Pencil two support, the iPad mini, or an older model iPad, there are a few steps to getting started. We've got guides for all the steps you need, from the first "Hello" to downloading the best apps and games, setting up your email and calendar accounts, getting Face Time and messages ready for communication, setting up face ID, and more. If this is your first device in the Apple ecosystem, welcome to the family. Even if you’re an iPhone X owner or a MacBook Pro devotee, the all-new iPad Pro is an entirely different beast. Sure, you could use it in much the same way you would an iPhone, but then you would be missing out on a plethora of shortcuts and tricks designed to better your experience. 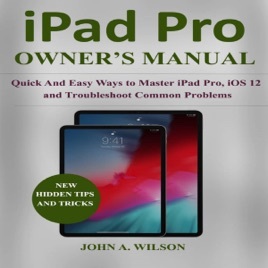 Thankfully, we assembled some of our favorite iPad Pro tips and tricks in this audiobook, all of which will help you make the most of your device. We'll walk you through the steps to getting started. After that, you'll have a blast learning all about the great features on your new Apple iPad. Scroll up and click buy with one-click to add this audiobook to your library.